This card, postmarked 18th Oct 1904, is titled as above. Has anyone knowledge of the house and its location? Tony – it is just an impression I have from long ago – could pix 395 and 355 both be from High Road, Chipstead, near what is called Upper Gatton and Upper Gatton Park. My Surrey A-Z shows 'The Old Forge' a stone's throw from Babylon / Crossways Lane(s). The Old Forge pictured in www.bansteadvillage.com/picture/number355.asp was in Hogscross Lane, Chipstead. Old maps show it as standing in front of the pond nearest to the White Hill / High Road junction. Details courtesy of ChipsteadVillage.Org website. Looking at other Adamstones pictures it seems that the names were sometimes prefixed "Ye olde....". 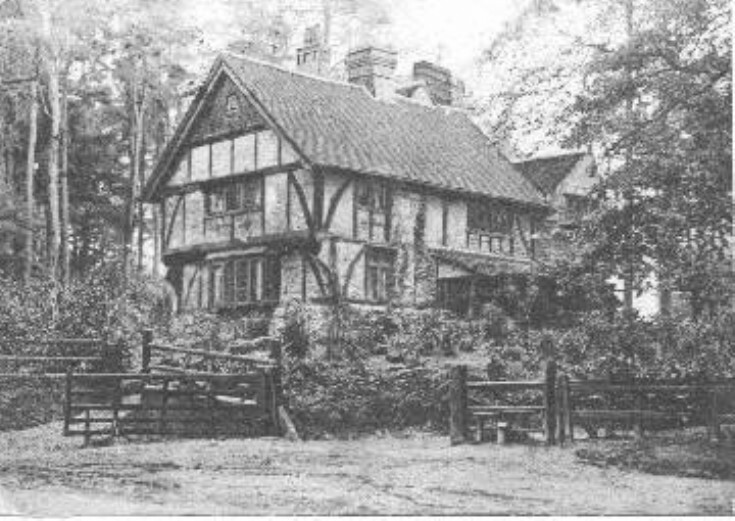 In this case it seems it is a photograph of an old (name undetermined) house in Chipstead.